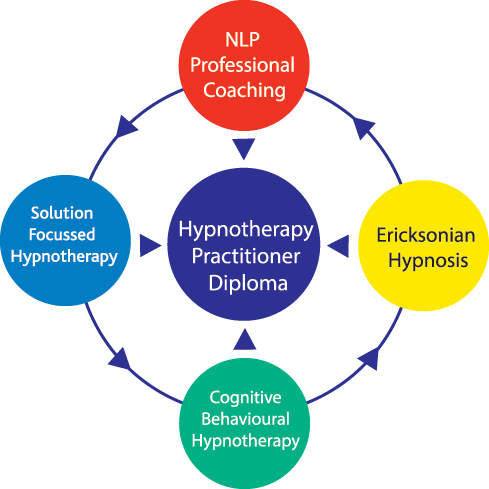 This externally accredited practitioner training in clinical hypnosis contains four separate courses, or modules, which may be taken in any order. These modules are repeated on a regular basis throughout the year, on weekdays, Monday to Friday – see our timetable. No prior learning is assumed so the courses cover everything from basic skills to advanced practitioner level techniques. Detailed training manuals are provided for each module and the courses are delivered in a highly practical way with the maximum possible time spent on practical exercises. As well as role-play work with other students we have, through our clinic, volunteer clients who attend for demonstration / practice exercises. Students are taught how to integrate the various different approaches to help clients to achieve effective therapeutic change. All students practice work is supervised and this supervision / mentoring is also provided for the first 12 months after completion of the course at no additional cost. The training programme is fully inclusive in cost – see our timetable – with the only exceptions being registration for the (optional) HPD, and the purchase of books. We supply a list of (optional) books with suggestions from where they can be most cost-effectively purchased. As part of the diploma, or as an accredited ‘stand-alone’ qualification, we offer the British Psychological Society (BPS) approved ‘Mindfulness Now’ certified teacher training course. Research has shown that Mindfulness offers powerful health and wellbeing benefits. Qualified teachers can be in high demand, teaching 1 to 1, as well as in groups and within organisations. The Mindfulness Now programme provides a fusion of Mindfulness Based Stress Reduction (MBSR) and Mindfulness Based Cognitive Therapy (MBCT), both are evidence based and the latter is recommended by NICE. Want to train as a coach?